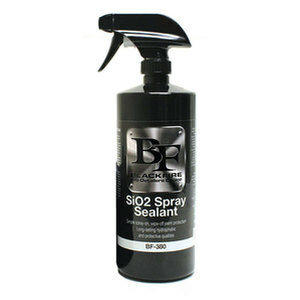 Blackfire SiO2 Spray Sealant is a hydrophobic spray sealant that protects paintwork for months. 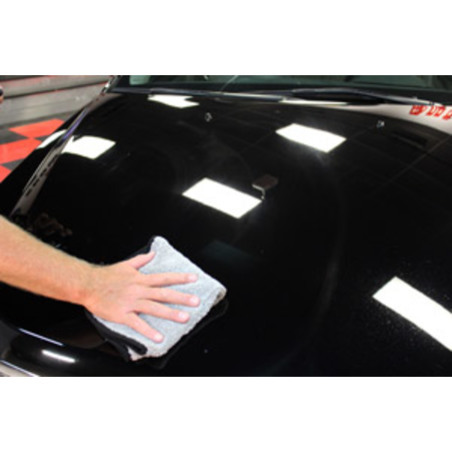 The long-lasting sealant offers simple spray on, wipe off paint protection. It provides protection against road film, industrial fallout, dirt and many other contaminants. SiO2 Spray Sealant’s hydrophobicity causes water to sheet and bead off your paint for months and prevents water marks. In addition to its protective qualities it also leaves your paintwork with incredible depth and a high gloss finish. It can be used as a stand-alone sealant or to enhance and extend the capabilities of an existing paint coating. When used for coating maintenance it will refresh the coating's hydrophobic capabilities and extend the period of protection. The spray formula makes it up to 4 times quicker to apply compared to standard synthetic sealants. Use on freshly washed and dried paint. Shake well. Either spray straight onto surface or onto clean microfibre cloth and apply using an even back and forth motion. Using another clean, microfibre towel buff away the residue and haze.